The scarpanid family consists of five airborne species which are defined by their habit of abducting prey and objects. Some swoop down from the sky to pick up two Pikmin at once or a single leader, but in Hey! Pikmin, they are also found carrying Sparklium Seeds, hearts, and occassionally treasures. Although most creatures in the family are in the Scarpanica genus, the Spiny Coppeller is in the Purpuralacus genus, and the Muggonfly is in the Draco genus. The Coppeller also is in the viridelacus species, which consists of one known subspecies. The Bumbling Snitchbug is a creature discovered by Captain Olimar during his second visit to PNF-404. It's a green bug-like creature with black arms attached to its head. It will steal leaders, and eventually hurl them into the ground, causing damage. Otherwise, it will wander around while flying with its wing-like antennae. Captured leaders may struggle to free themselves by rotating the analogue stick or have a second leader throw Pikmin to combat the enemy. Weighing the bug down will cause it to crash into the ground, where it is easily overwhelmed. The Coppeller is a creature introduced in Hey! Pikmin. 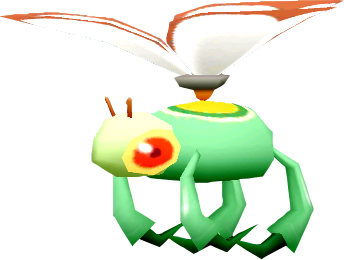 They are small, airborne, quadrupedal insectoids that, like the scarpanids from the previous games, can carry Pikmin as well as other objects. They will swoop onto the screen in groups, carrying Sparklium Seeds, Pikmin, and treasures, at which point the player will be able to take them out by throwing a single Pikmin at them. If allowed to escape, whatever they are carrying will be permanently lost. A more dangerous spiny version of this creature can be found in later levels. The Muggonfly is a colossal dragonfly-like scarpanid introduced in Hey! Pikmin. It resembles a large Coppeller with a long tail that it uses to carry food back to its den. It can neither hurt nor be hurt by the player, but its food pouches can be destroyed and raided. It is very rare, appearing only once in the entire game, and is the only member of its family that is unable to harm Captain Olimar and/or Pikmin. The Spiny Coppeller is a specially adapted relative of the Coppeller introduced in Hey! Pikmin. They are slightly larger than normal Coppellers, and are completely unkillable, as any Pikmin thrown at them will be impaled on their spiky armor. They do not carry anything and rarely move, instead simply hovering in place and blocking the player. They are one of the only enemies in any Pikmin game that can not be killed. 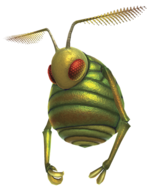 The Swooping Snitchbug is a creature present in all three Pikmin games. They are legless, round, flying insects that have evolved wing-like antennae as a means of locomotion. 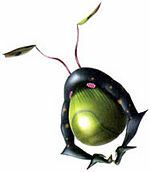 They attack by swooping down and grabbing prey, though this species only grabs the Pikmin, not the leaders. After carrying the prey for a few seconds, they violently throw it toward the ground, which forces the Pikmin to be replanted and revert to its leaf stage. Snitchbugs can be weighed down by throwing many Pikmin (or at least one Purple Pikmin) onto their body, causing them to crash to the ground and making them susceptible to attack. In Pikmin 3, throwing a Rock Pikmin at the creature will cause it to fall to the ground, and they replace the role of Bumbling Snitchbugs by gaining the ability to grab leaders as well as Pikmin. Many members of this family have the word "Snitchbug" in their name, which is a combination of "snitch" and "bug"; to "snitch" means "to catch", in this context. "Coppeller" is likely a combination of "Copter" and "Propeller", in reference to the creatures's helicopter-like wings. Their scientific names use the genus name Scarpanica, which has no meaning, but reflects the family name. This page was last edited on February 27, 2019, at 21:25.